A.L.C. "Friedan" crepe jumpsuit. Crew neckline. Sleeveless. Side pockets. Back welt pockets. Open back; self tie detail. Fitted through straight legs. Full length. Exposed back zip. Viscose/spandex. Polyester lining. Dry clean. Imported. Model's measurements: Height 5'11"/180cm, bust 32"/81cm, waist 24"/61cm, hips 35"/89cm, dress size US 2. 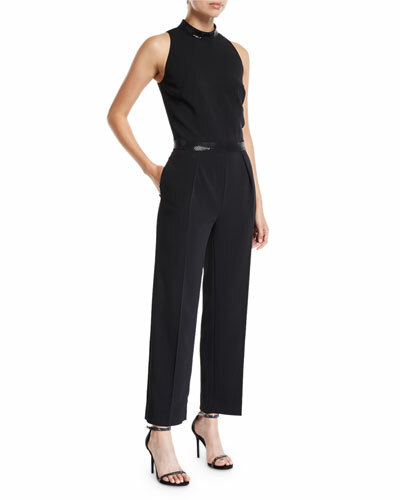 EXCLUSIVELY AT NEIMAN MARCUS Aidan by Aidan Mattox crepe jumpsuit with cutout sides and back. Approx. 45"L down center back. 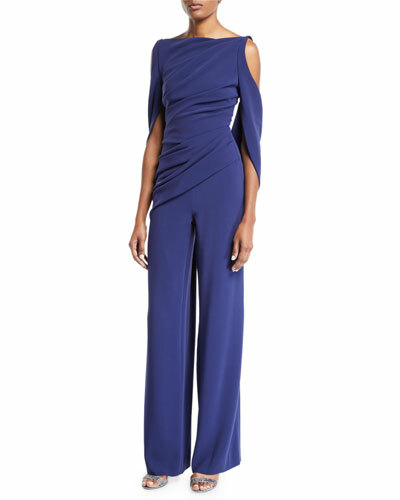 EXCLUSIVELY AT NEIMAN MARCUS Aidan by Aidan Mattox crepe jumpsuit with cutout sides and back. Approx. 45"L down center back. Plunging V neckline; racerback. Sleeveless. Fitted band at bodice. Relaxed through straight legs. Full-length hem. Exposed top back zip. Hidden lower back zip. Polyester/spandex. Polyester lining. Dry clean. Imported. EXCLUSIVELY AT NEIMAN MARCUS Aidan by Aidan Mattox jumpsuit with striped sequins. Approx. 31" inseam. V neckline. Sleeveless. Fitted bodice. 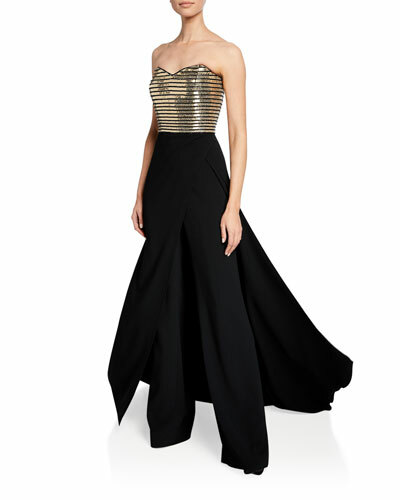 EXCLUSIVELY AT NEIMAN MARCUS Aidan by Aidan Mattox jumpsuit with striped sequins. Approx. 31" inseam. V neckline. Sleeveless. Fitted bodice. Hidden back zip. Relaxed, straight legs. Ankle-length hem. Polyester self. Polyester/spandex lining. Spot clean. Imported. Model's measurements: Height 5'10.5"/179cm, bust 32"/81cm, waist 25"/64cm, hips 35"/89cm, dress size US 2/4.